Remove pie crusts from pouches; unroll on work surface or cutting board. With 4-inch cookie cutter, cut 5 rounds or shapes from each crust. In 5 of the rounds, cut out shape with small cookie cutter or prick with tines of fork to allow steam to escape. In medium bowl, stir together pineapple, cornstarch and five-spice powder until combined. Divide pineapple mixture evenly among plain dough rounds. Top each round with cutout or pricked round; press edges firmly with fork to seal. Place on cookie sheet; freeze 30 minutes. Heat gas or charcoal grill. Remove pies from freezer; place on grill-safe baking or pizza stone. Place baking stone on grill over medium-high heat. Cover grill (leaving vent open if using charcoal grill); cook 10 minutes or until crusts are fully cooked and crisp. Remove from baking stone to cooling rack; cool completely. Store in airtight container. Don’t waste those coals! Grill your pies first, then grill your dinner while they are cooling. 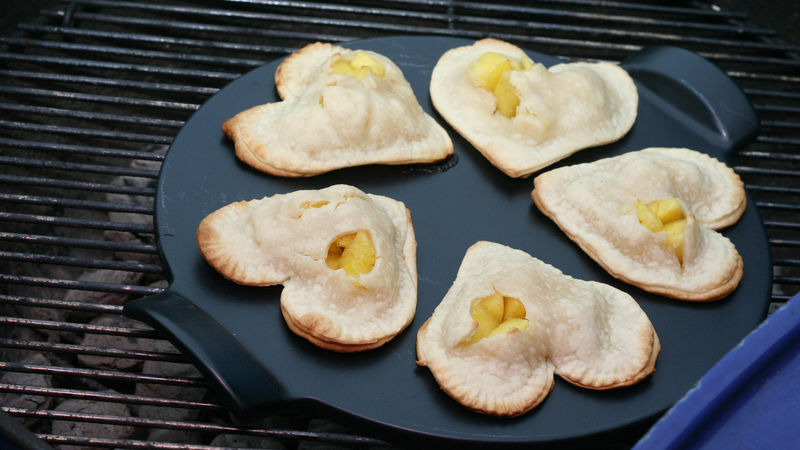 If you have a pocket pie mold, you can use it to cut the crust into shapes; some pie molds include a hole to cut a vent in the top crust so you can skip that step.